Hawk Industries GAF-125 "GAFHawk 125"
GAFHawk N101GH as I found it, stored next to All West Freight's hangar at their private airfield. The aircraft is still complete and looks very much flyable. Click on the photo for a larger image. During a visit on 11 June 2006 to All West Airport (AK77) near Delta Junction in Alaska, an aircraft was noted in storage there of a type I could not recognize. It was a medium-sized high-wing freighter aircraft with a square-section fuselage and a single large radial engine in the nose. It carried the registration N101GH, and the data plate revealed it to be a Hawk Industries GAF-125, msn 001. Once back home, I searched the books and other resources for information on this aircraft, and it turned out to be a very special and unique machine. The GAF-125 was developed by Hawk Industries Inc. from Yucca Valley, CA. This company specialised in equipment and tools for the off-shore oil industry, and was looking for a more efficient way to transport their products all over the country. Road transport was too slow most of the time, and loading their large and unusually-shaped products onto conventional aircraft often posed many expensive and time-consuming problems. And so in July 1977, the president of the company, Ernest "Ernie" Hauk (not Hawk! ), together with designer Larry Stewart, initiated the development of a freighter aircraft that was to overcome these problems. The design was named the GAF-125 GAFHawk, with GAF meaning General Aviation Freighter. The name later changed to GAFHawk 125. The design would have to meet many demands: rear loading door for easy on/off loading, STOL capability for remote airstrips, square-section fuselage for maximum loading efficiency, single engine to lower maintenance time and cost, single-pilot operation etc. Looking like a miniature version of the actual GAFHawk, this little aircraft served as a flying testbed for the GAFHawk's development. It is now preserved at Roy Williams Airport in Joshua Tree, CA. Photo taken by AirNikon in May 2004. Click on the photo for a larger image. The company obtained 1956-built Piper PA-22-150 Tri-Pacer N6911B (msn 22-4186), which was almost completely disassembled in the workshops of Hawk Industries' Aircraft Division on Aviation Drive, at the small airport in Yucca Valley, California. The little aircraft was then rebuilt, but in an extensively modified form. It was made to look like a miniature version of the GAFHawk design, to serve as a small scale flying testbed for the GAFHawk's development. The aircraft was appropriately named the MiniHawk, and first flew in 1978. Based on the lessons learned from the Minihawk, an actual GAF-125 prototype was built, and registered as N101GH on 9 December 1981. This much larger aircraft made a successful first flight on 19 August 1982, powered by a Pratt & Whitney PT6A-45R turboprop engine. The aircraft division of Hawk Industries was later renamed to Hawk International. Initially they were fairly successful in selling the GAFHawk, but by 1983 the certification process had become exceedingly difficult. Some suggest foul play by certain parties. By 1989 the prototype still hadn't been fully certificated, although by then 20 firm orders had already been received, as well as options for another 93 aircraft once certification would have been obtained. And despite grave competition from the Cessna 208, there were even plans to develop larger as well as smaller versions of the aircraft. But in 1990 Hawk Industries gave up. Full certification was never obtained, and production was never started. Prototype N101GH remained the only GAFHawk 125 in existence. Many thanks to Jon Anderson for these scans. The GAFHawk's original PT6A turbine engine was later replaced with this impressive new radial engine. It is a PZL-Kalisz ASz-62IR-M18/K9-BB. Click on the photo for a larger image. The GAFHawk was originally powered by the 893kW (1,198shp) PT6A-45R turboprop, but in 1992 this was replaced by a much more impressive Polish-built 853 kW (1,145hp) PZL-Kalisz ASz-62IR-M18/K9-BB radial engine, fitted with a big four-bladed prop. This is a new and more powerful version of the very successful Soviet-built Shvetsov ASh-62 engine, which dates back to the Second World War and powers the Antonov 2, the Lisunov 2, and several other Russian-made aircraft. New and improved versions of this engine are still being manufactured by PZL-Kalisz in Poland, and are being used on many PZL-M18 Dromaders and even some DHC-3 Otters that were converted by Airtech Canada. At the time of our visit to All West Airport in 2006, N101GH was still registered to Hawk Industries Inc., Yucca Valley, CA, despite having been owned by Bill Michel for 14 years already. However, its registry status was "Undel Tri" (Undeliverable Triennial), which at that time meant that an Aircraft Registration Report, sent by the FAA once every three years, was returned by the Post Office as undeliverable. The MiniHawk testbed N6911B was also still registered, with its status quoted as "In Question", and no registered owner. It just says "Sold to Hawk International", which was the new name for Hawk Industries' aircraft division. The MiniHawk eventually went to Roy Williams Airport in Joshua Tree, only 15 km (9.5 miles) from Hawk Industries' workshops in Yucca Valley. The little aircraft is now preserved there, swiveling freely on a short pole and acting as a big windsock. The deal was that the FAA started requiring testing far beyond what would have been considered normal. It never achieved certification, and the engine was sold. It is speculated that Cessna's new (at the time) Caravan had something to do with the FAA difficulty. Ernie Hauk began negotiations with PZL to build it in Poland for the eastern European market. They got as far as developing the mount for the 62R engine and then negotiations stalled and PZL lost interest. Wild Bill at All West Freight bought the GAFHawk from Ernie Hauk, reportedly for "the price of an Otter" without an engine. The deal included that Bill would buy a new PZL engine, complete the install, and he would own the aircraft. Hawk maintained the manufacturing rights. Bill worked the aircraft for about four years with the legality of commercial operation being questionable. The FAA finally grounded the airplane in a unique fashion. The airplane is ok to fly, but Bill can not fly it himself, nor direct its operation by court order. The penalty for noncompliance is forfiture. That is why it is sitting where it is now. 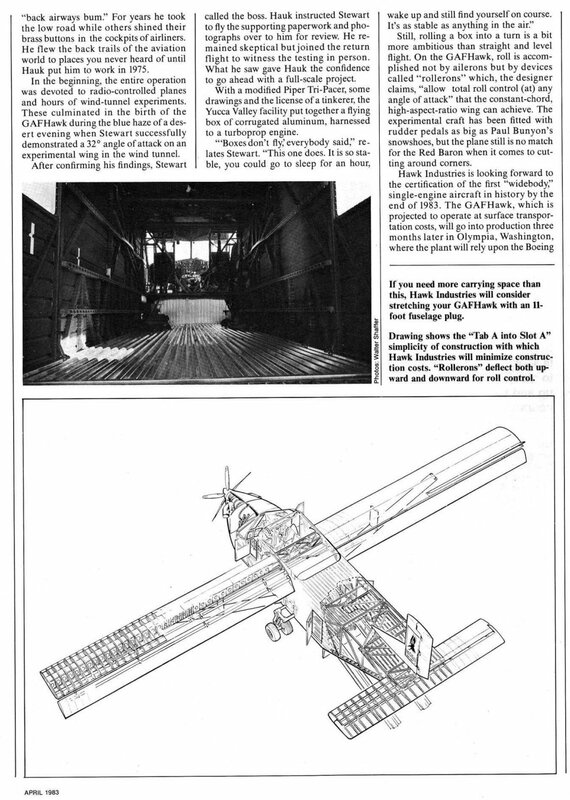 I received scans from a GAFHawk125 public relations package, which was distributed by Hawk Industries during the early and mid 1980s. It is far too much material to present here, and so I decided to create a separate GAFHawk PR Package page for it. Update January 2011 - The story completed, and more! The data plate of GAFHawk 125 N101GH, showing the official type as a GAF-125, and the msn as 001. Click on the photo for a larger image. Jon Anderson (see Update March 2007, above) kept in regular contact with me, and thanks to him I can now fill the gaps in the history of the unique GAFHawk 125. Development of the GAFHawk prototype initially stalled by late 1983. Flight testing had been completed, but Hawk Industries continued to have serious problems with certification by the FAA. Finally Ernie Hauk started to work with PZL in Poland to build the aircraft there, for the eastern European market. 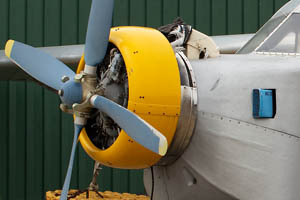 PZL was interested, but negotiations fell apart after they had developed the mount to put their ASz-62IR radial engine on the airframe. 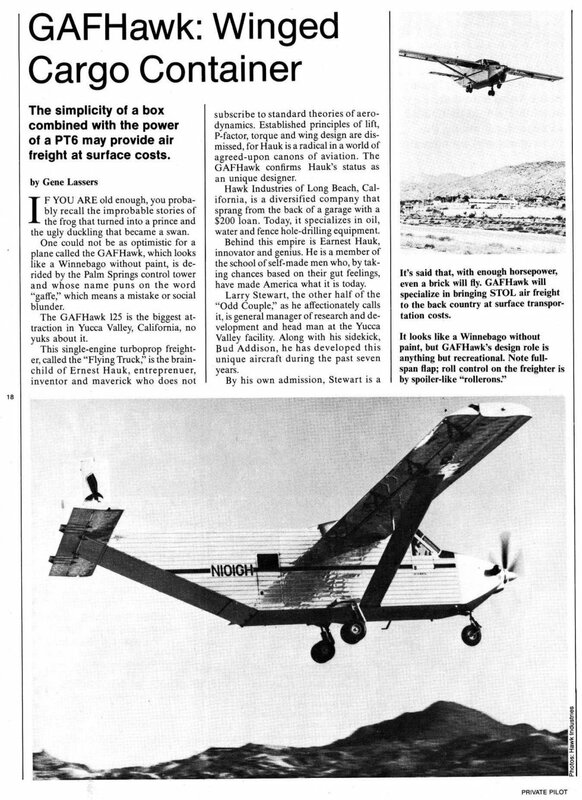 PZL did produce one such mount, which was shipped to Yucca Valley, but eventually Ernie Hauk never used it. 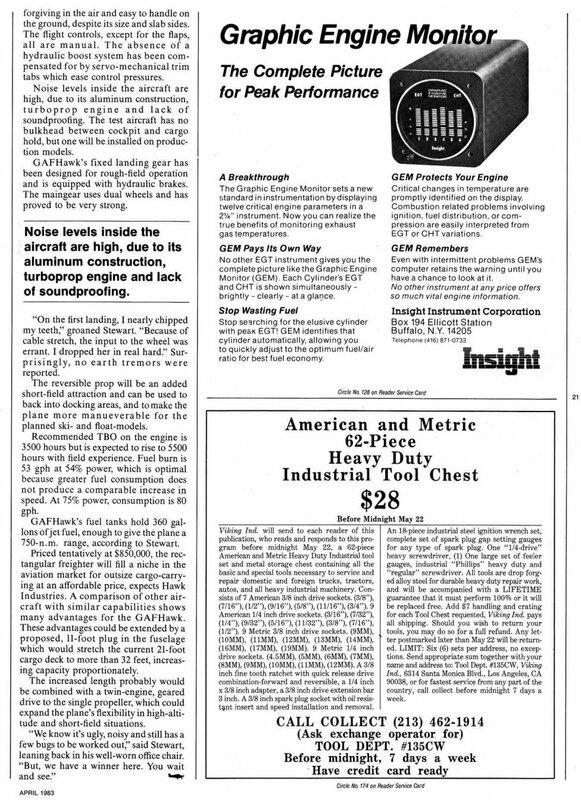 In 1990 the cost estimate to complete certification and preproduction exceeded 20 million dollars, and Ernie gave up completely on certifying and producing the GAFHawk. 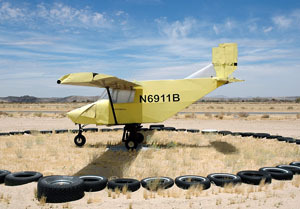 The PT6 turbine engine was sold and the aircraft was parked engineless at Yucca Valley. 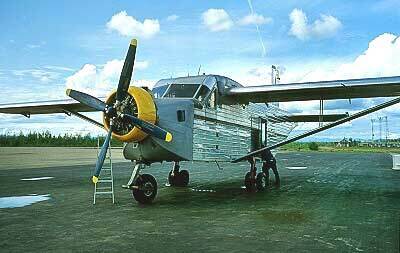 In 1991 Bill Michel lost a DHC-3 Otter (N338D msn 338) in a forced landing, following an engine failure. When he was looking for a replacement aircraft he found the GAFHawk. 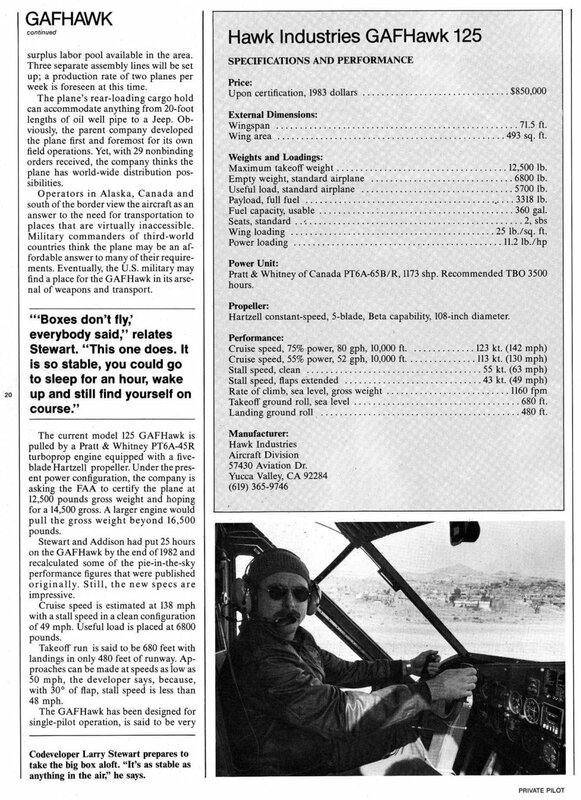 Bill immediately saw its cargo- and short-field capabilities as a really good answer to the type of flying he did, and in January 1992 he struck a deal with Ernie Hauk to buy the plane. Work was started at Yucca Valley to get it ready for flight, and Wild Bill personally installed a brand new PZL radial engine, using the mount that PZL had built for Hawk Industries years earlier and that had not seen any use yet. The first engine Bill used was a factory-new 1,000 hp PZL power plant, bought from MELEX in the USA. With most of the work done, Ernie and Bill signed the bill of sale on 5 June 1992. N101GH however remained registered to Hawk Industries Inc. for practical reasons. The GAFHawk is seen here on 7 July 1992 at Northway Airport in eastern Alaska, not far from the Canadian border. Bill Michel had flown it from California to Alaska less than a week before. Photo by Jim Wark. A few weeks later, on 28 June 1992, Bill was due to depart Yucca Valley for Sterling, Alaska, which was his home base at the time. The GAFHawk was parked out in front of the hangar, all ready and loaded heavy for the long flight to Alaska, when early that morning, at 04:57 local time, the very powerful 1992 Landers Earthquake struck almost exactly below Yucca Valley. The quake was a hefty 7.3 on the Richter scale, and its epicenter was only 14 km (8.5 miles) due east of Yucca Valley airport. Seismic waves rippled the ground vertically for several long seconds, as if the ground were water, causing the heavy GAFHawk's left main gear to collapse. The damage took three days to repair, and Bill finally left Yucca Valley for home on 2 July 1992. 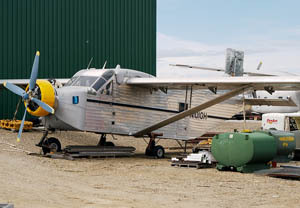 During Bill's operations in Alaska, his original PZL engine was giving him some problems. To solve this he went to the PZL-Kalisz factory in Poland in 1993, and bought a brand-new 1,145 hp PZL ASz-62IR-M18 engine. He had it crated and shipped to Alaska, where it replaced the less powerful radial he had bought from MELEX the year before. Bill flew the GAFHawk for only a few years. By 1996 he had run into difficulties with the FAA and the aircraft was grounded and placed in storage at Sterling, with less than 270 hours total time on the airframe, and only about 90 hours on its new engine. Bill incorporated his company All West Freight Inc. in August 1997 (but the GAFHawk remained his personal property), and he eventually moved his business from Sterling to his new All West Airport near Delta Junction. He received a permit for his GAFHawk for one ferry flight only, and on 6 October 2002 he flew his rare aircraft out of Sterling to Delta Junction, where it was again placed in storage. This would be the aircraft's last flight until 2010. Bill ground-ran it in 2004 and 2008, but other than that the aircraft saw no activity at all during these years. GAFHawk 125 sold and flown! On 27 March 2010 the unique GAFHawk took to the air again. Click the photo to enjoy a short movie of a noisy and smoky start-up. Note: this movie clip will need some time to load. Also, it may require a download, and it may not work in older browsers. I serviced the engine, cleaned the spark plugs and magnetos, greased everything, changed out all the windows, did some sheet metal work on some storage damage, rebuilt the brakes, cleaned many components. Had to buy tires, rebuild the landing gear, address prop issues, and buy a new oil cooler. Some of the control cables had stretched and their tension was gone. Still have some work to do, the fiberglass fuel tank needs attention, there are little squawks here and there, as well as the extensive avionics need a massage. And then, on 27 March 2010, the unique GAFHawk took to the air again, for the aircraft's first flight in almost 8 years. It was a single short test flight, with "Wild" Bill Michel at the helm and Jon in the right seat as an observer. Jon sent me a short but very nice movie clip of the noisy and smoky start-up for this flight, which you can enjoy by clicking on the photo on the right. Make sure to turn the sound of your computer well up! On 30 December 2010 the GAFHawk 125 N101GH was officially registered to Jon's name, and he is now looking forward to bringing his aircraft home as soon as possible. First and foremost I'd like to express my thanks to Jon Anderson for all the interesting background information he provided, and for keeping me up-to-date on his dealings with the GAFHawk over the years. Thanks also go to AirNikon, for the use of his photo of the rare MiniHawk, and to Jim Wark for the use of his photo of the GAFHawk when it was still flying commercially in Alaska. I am also much obliged to François Cousineau, who very kindly sent me a scan from the French "Aviation Magazine-International", dated 15 November 1981. The magazine contained some interesting background information on the MiniHawk and on the development of the GAFHawk 125. Further information has also been taken from Jane's All The World's Aircraft 1989-1990.